If you own a .308 Win, odds are you use it for hunting. When the .308 Win was introduced to the commercial market in 1952 it immediately gained popularity as a powerful hunting round, and today it’s become the most popular short-action hunting cartridge in the world. Here in the United States it’s used to take down caribou, whitetail deer, moose, and elk, while in Africa it’s used by Bushveld hunters to take down various sizes of antelope from the smaller Duiker to the much larger Eland, and word is its extremely popular in Sweden, too. It makes sense this would be a globally-popular hunting round, after all, it’s a big, bold cartridge capable of phenomenal stopping power, and that’s exactly what you want on a hunt. 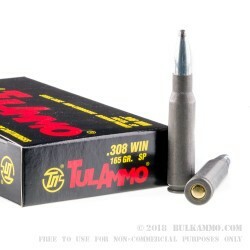 These .308 Win rounds are made at the Tula Arms Plant. Tula was founded in 1712 with the original purpose of manufacturing firearms, ammunition, and swords so the locals could protect themselves from invaders, and they not only succeeded in their goals but surpassed them rather significantly. 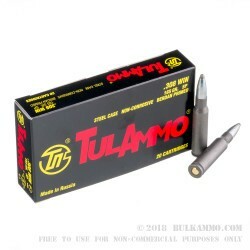 Today Tula continues to supply ammunition to their local military and law enforcement agencies, but they also distribute their ammunition to shooters all over the world. Much as the .308 Win has become a globally popular hunting round, Tula has become a globally popular manufacturer. 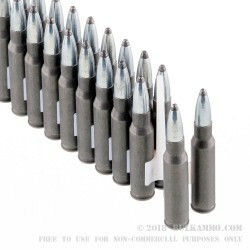 At 165 grain these are considered medium-weight rounds for the .308 Win. Being somewhat lighter allows them to reach higher speeds, but they’re still heavy enough to put massive holes in your targets. These are SP rounds and as such are capable of impressive expansion on impact, expanding slowly to create crippling wound cavities. Another one of the great things about SPs is that they can be used in areas where HPs are banned. Each of these rounds has a muzzle velocity of 2625 feet per second and impacts targets with stunning force. There are 20 rounds in this box. 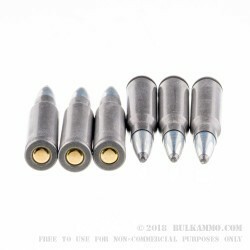 These rounds are best for target practice and plinking and can also be used for hunting game up to the size of whitetail deer. Order now, and feed your gun. Great stuff, used TulAmmo a long time every thing was flawless. Q: Is this ammo reactive with a magnet? My range won't allow any long range ammo that draws a magnet. A: Hello Jeremiah, This ammunition is loaded with a lead core, bi-metal jacketed projectile. Due to the steel content in the jacket, this ammunition will not pass any type of magnet test.